Magic Cube is a 3 hours module as part of a team or group workshop: operational synergy, cross-functional performance, etc. Magic Cube is a game about strategies to set and to achieve objectives, individually and with a Team. 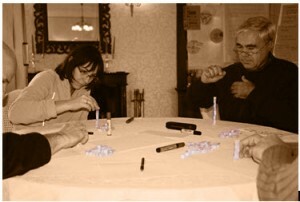 The game allows participants to explore setting and achieving objectives related processes. It underlines the individual mechanisms and models that are used, which reflects the current way of being. What happens during the game highlights the current working behaviors and relationship to things, which limits the individual and team performances. The Magic Cube game’s stages are the “unknown”, the “known”, individual, and team. Such stages allow the participants to understand means, approaches and strategies for people to set objectives when it is about not only setting them but achieving them. How to build-up from individual differences to team performance.